Dr. Soumya Kurup was a topper in NEET-PG and is now completing her DM, Endocrinology which makes this the only book for NEET-PG/AIIMS/PGI in Biochemistry by a super specialist. 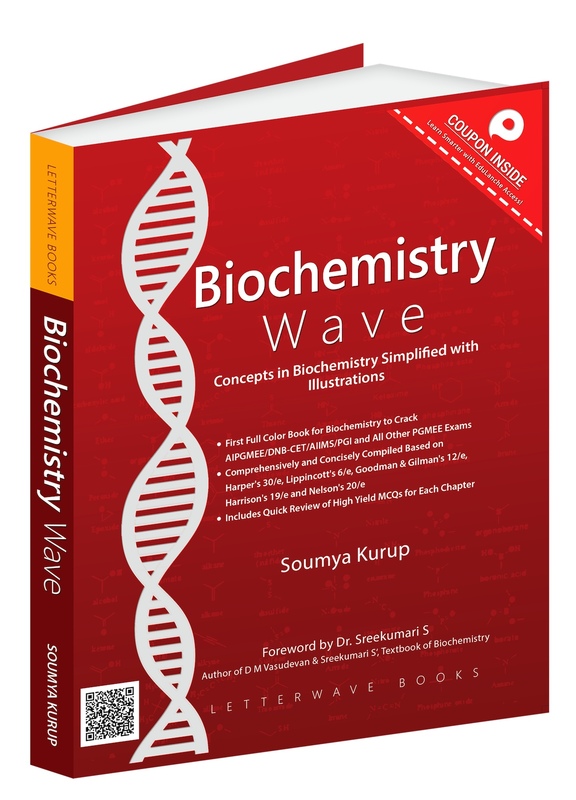 "Since Medical Biochemistry is gaining importance in the new pattern of exams, this book will help many students in the pursuit of their dreams"
"Book was so helpful..I could complete whole biochem in 5 days with that book...."
Submitted by Shivaa on Mon, 2018-03-05 12:12. Its a good book, so much effort has been put by Dr. Soumya to make the book concise and readable. Submitted by vvk108harekrishna on Tue, 2016-08-16 13:29. Though biochem was a subject where we could score marks easily during our ug days, it was the same biochem which we always used to keep for the later during our pg preprtns. The reasn being: boredom and difficulty in memorizing the cycles and complex reactions. This book first of all removes the inhibition we have towards biochem. Simplified diagrams and charts makes things much more easier to learn. Small boxes and easy to memorize tips are the highlight of this book. Overall, i would say, this is one book which any pg aspirant should have to clear the exams with ease. Thank you edulanche and Dr soumya for this wonderful gift. Submitted by Guest on Mon, 2018-02-12 21:23.
this is the first and last book i read for biochem... it has all that is reqd in simplified manner. it is not voluminous or time consuming. the summary of imp one liners at the end of the book is wonderful for revision. i loved the colorful illustrations and the fact that evrything explained clearly with all the controversies explained. thank u dr soumya kurup for such a wonderful book. Submitted by paresh_wadile on Tue, 2016-07-12 19:50. Biochemistry is an important but poorly remembered subject, biochemistry wave has simplified the topics for easy grasp & better retention. A must have !! Submitted by sheenam5 on Sat, 2016-03-26 17:26. Submitted by VivekV on Thu, 2016-02-25 16:39. Biochem was always the "never stays in my head" & "too boring to read" kind of subject for me. But unfortunately, a huge volume of questions are being asked from biochem and it is a definite high yield subject. And i Certainly had much difficulty in consolidating knowledge from all the various boring text buks for biochem. Well, biochemistry wave simply changed the outlook of the subject for me.. Its presented in a clear, consice and attractive manner which makes the subject much interesting to me. The multicolored pages also helped me in keeping everything retained in my brain. Ideal for entrance preparation. Way to go edulanche.. Do come up with more of such buks..!! Submitted by abhisheksree on Tue, 2015-09-22 22:17. Not only biochemistry...the book s also covering some important points Harrison.. Submitted by dratanusengupta88 on Wed, 2015-09-02 12:28. Biochemistry being one of the toughest subject,one needs to have a clear concept to solve such mcq. This book is excellent and explains everything perfectly.. Highly recommended. Submitted by sanju89rulz on Tue, 2015-08-25 15:21. 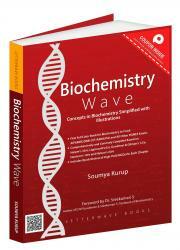 After goin through biochemistry wave by soumya kurup i can confidently say that it is one of the best book for the subject available now. The content has been explained in a clear and concise manner with the cycles and metabolisms explained beautifully.it is really helpful to clear the concepts. Considering how important biochemistry is for pgmee like aiims this book definitely will give the extra edge with its student friendly presentation and comprehensive coverage of the subject. Sincerly thank edulanche and especially dr.soumya kurup for this initiative that will help a lot of pg aspirants like me to crack this important subject.